Told of in Oriental legends, it is the strongest destructive god and the god which governs over regeneration. It is told that when the Network System descends into chaos, it will erase the existing system, and create a new one. Its Special Moves are slicing and stabbing everything in the world with the sword of light emanated from the "ZERO-ARMS: Orochi" (Ama-no-Habakiri), and an ultimate technique in which it points the sword of light (emanated from the ZERO-ARMS: Orochi) at the heavens, which then rain incessant bolts of lightning upon the ground (Yakusa-no-Ikadzuchi). 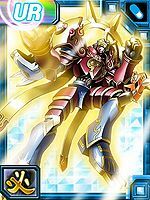 A legendary Digimon born from the union of the Spirits. It is an existence that rules over "death" and "rebirth", referred as "God of Warfare". It is said that it wields power able to shake heaven and earth. Title: 「究極武神」 — "Ultimate War God"
n., From Susanoo-no-Mikoto 「須佐之男命 (スサノオミコト)」, who was the god of oceans. 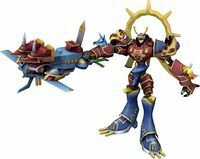 Anime/Manga Digimon Frontier: "Light and Darkness are One! Kouichi's Last Wish"
Points ZERO-ARMS: Orochi's sword of light at the heavens, which rain incessant lightning bolts. Summons a spiraling thundercloud from which eight dragons of lightning emerge to attack the enemy. Ama-no-Habakiri  Heavenly Wings Beheading 天羽々斬 N/A Celestial Blade Slashes through everything in the world with the blade of light extending from ZERO-ARMS: Orochi. 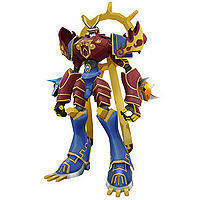 Fires from ZERO-ARMS: Orochi two spheres of energy, red and blue, that merge and cause a big explosion. 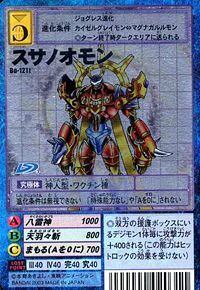 After Kouichi is scanned by Lucemon Falldown Mode and gives his spirits to Kouji, Kouji fused with Takuya and all 20 spirits to become Susanoomon. Lucemon Falldown Mode uses his Paradise Lost attack, hitting Susanoomon with several punches but when he attempts the kick maneuver Susanoomon punches him in the face interrupting the attack. Susanoomon attempts to punch him again but Lucemon Falldown Mode dodges and starts to beat up on Susanoomon more, eventually using his Dead or Alive attack to try and finish Susanoomon off. 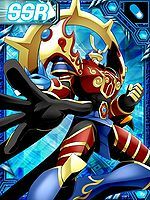 Susanoomon splits up into Kouji and Takuya again, causing the light and darkness elements of the attack to split apart nullifying the attack. 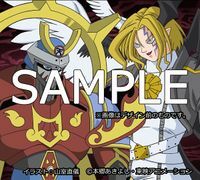 They remerged back into Susanoomon and who used his Ama-no-Habakiri attack to cut Lucemon Falldowm Mode in half scanning his holy data. But, his dark evil data would form into Lucemon Satan Mode. 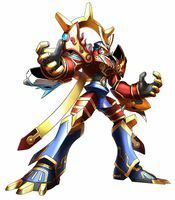 Takuya and Kouiji fused into Susanoomon again to fight Lucemon Satan Mode. 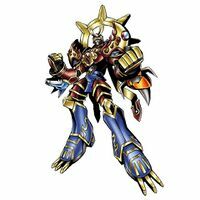 He attempts to break into the Dark Area it Lucemon now held in it's arms after seeing that Lucemon Larva that was inside it, but was repelled and fell defeated. After regrouping Takuya, Kouji, Izumi, Tomoki, and Junpei all combine into Susanoomon. 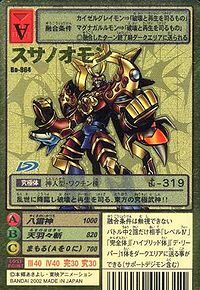 They go after Lucemon: Satan Mode again and this time Susanoomon break into the Dark Area and knock Lucemon Larva out destroying the Dark Area and uses his Yakusa-no-Ikazuchi attack to restrain Lucemon Satan Mode. He finishes it with Ama-no-Habakiri allowing him to scan its data. But, Lucemon Larva sneaks up behind him and stings him through the chest. Susanoomon 'ejects' the chosen then changes his weapon into a sword. 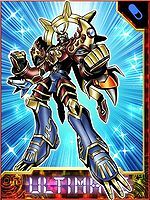 He splits up into the ten human hybrids, each with a copy of the sword, and each take a slice at Lucemon Larva destroying it once and for all. While fighting against an army of Belial Vamdemon and Venom Vamdemon Takuya is delivered all spirits allowing him to Ultimate Spirit Evolve into Susanoomon and fight Venom Vamdemon. 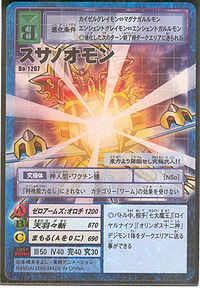 Susanoomon appears briefly when Ex-Agnimon or Ex-Wolfmon uses the Ancient Spirit Evolution attack. His tecnique is ZERO ARMS OROCHI. DORUmon: By finishing the quest Card Retrieve with 1 HP remaining in Very Hard Mode. Agumon: By finishing the quest Seal the Souls and sacrifice a Defense Rom Delta in only 10 minutes in Very Hard Mode. V-mon: By finishing the quest Card Retrieve with 1 HP remaining in Very Hard Mode. Guilmon: By finishing the quest Seal the Souls and sacrifice a Defense Rom Delta in only 10 minutes in Very Hard Mode. 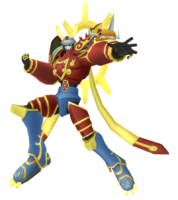 Susanoomon can be created by fusing either Super Starmon with Magnamon or Yatagaramon with Kongoumon. 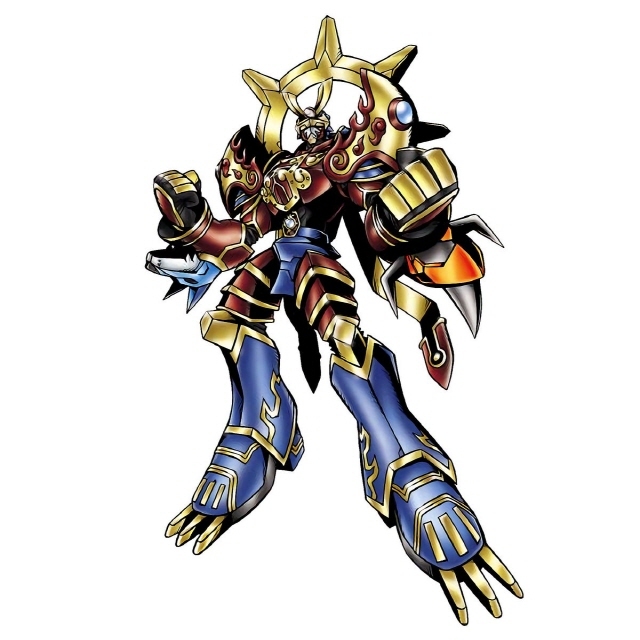 In order to create Susanoomon, both Digimon must be at level 73 or higher, a total of 88888 or more of their total species' experience and at least 460 of Spirit. 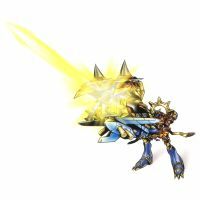 Susanoomon can also be hatched from a DigiTama created by a Bird-species Digimon with at least 300 Spirit and a Holy-species Digimon that must be at level 50 or higher. The DigiTama must have more than 300 Spirit and 8000 points of Bird-species experience in order to hatch. However, there's a chance that the DigiTama will instead hatch into Shakkoumon, Karatenmon or Kabukimon. 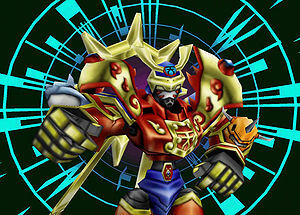 Susanoomon is also used to create Chronomon Holy Mode by being fused with Valdurmon. In order to do it, both Digimon must be at level 83 or higher, have maximum friendship with the Tamer and the player must have befriended Chicchimon. 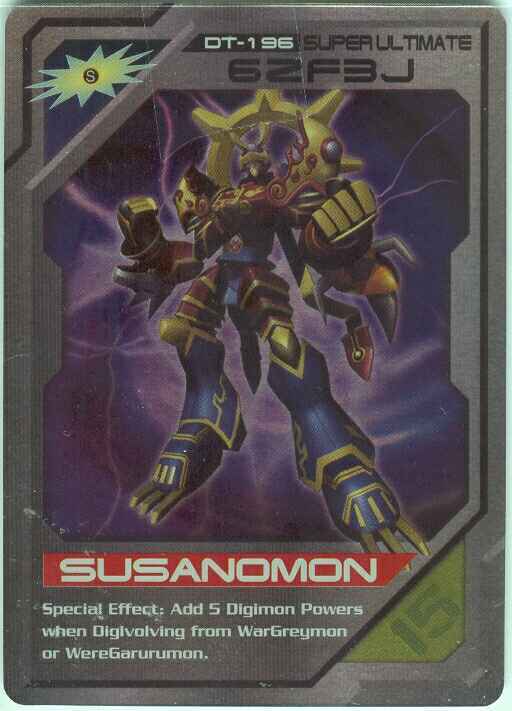 Susanoomon can only be obtained as a collectible card. Its card can be unlocked when completing the Warrior Ten (十闘士 Juttoushi) set. 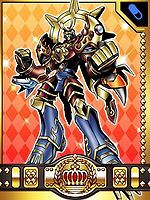 Susanoomon is available as a Digimon Medal. 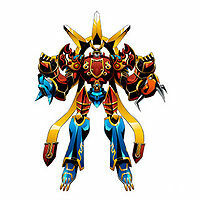 Susanoomon is an Ultimate-level Digimon which can be evolved from Agnimon. In the 1.05 update, KaiserGreymon and MagnaGarurumon were added to the game, making Susanoomon work like in the international edition. Susanoomon can also be recruited to the city after beating the game and unlocking the dimensional dungeons. 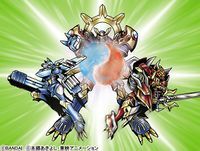 It will appear on Logic Volcano and ask the player to defeat Examon. If talked to again after doing so, it will go to the city. It appears randomly in Dimensional dungeons and boosts the player's Digimon's happiness. 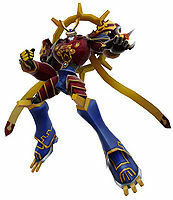 Susanoomon is a Super-Ultimate Digimon obtained by fusing KaiserGreymon and MagnaGarurumon via the Digivolution dojo (requires Paildramon to be already in the city). 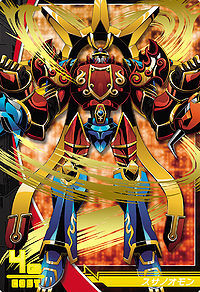 This ultimate military god of the east descends in times of trouble to govern destruction and regeneration! The ZERO-ARMS: Orochi's roaring thunder cannon sets existing systems back to zero!! 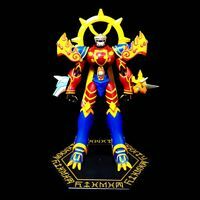 This eastern god of destruction and rebirth bisects the world! The ultimate warrior has descended from the East!! 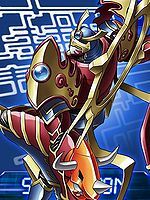 The strongest god of destruction told of in Eastern legends, it descends when the Network System begins to show abnormalities. It also governs over rebirth, and will recreate a new system after it has destroyed everything. 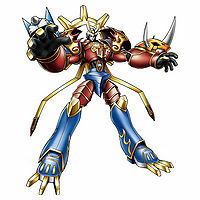 ↑ Digimon Frontier: "Fight Susanoomon, Lucemon Reaches the Human World!!" 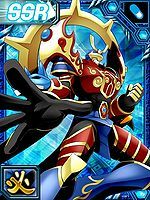 ↑ Digimon Frontier: "Light and Darkness are One! 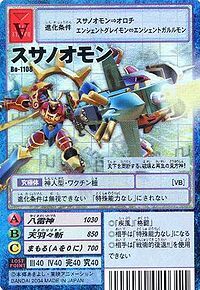 Kouichi's Last Wish"
↑ Susanoomon is listed as a "Super Ultimate" in the Bandai America Digimon CCG. ↑ Orochi is a reference to Yamata no Orochi (八岐の大蛇), the name of an eight-headed snake slain by Susanoo in Japanese mythology. 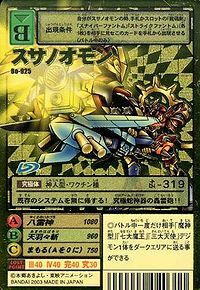 ↑ This Wolfmon is known in the game as Extra Wolfmon (EXヴォルフモン EX Vorufumon). This page was last modified on 17 April 2019, at 05:39.